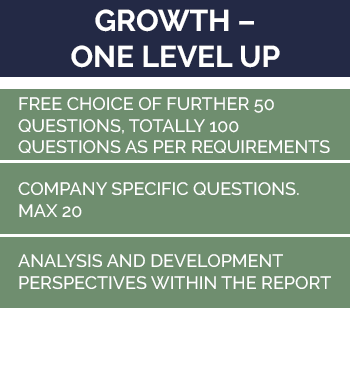 Emphasize the boards development opportunities with a thorough BESTYRELSESVURDERING®. We work professionally with board evaluations for all kinds of companies, both public and private. Do you and your board want inspiration and concrete suggestions for how to develop the board? If so, a board evaluation is for you. 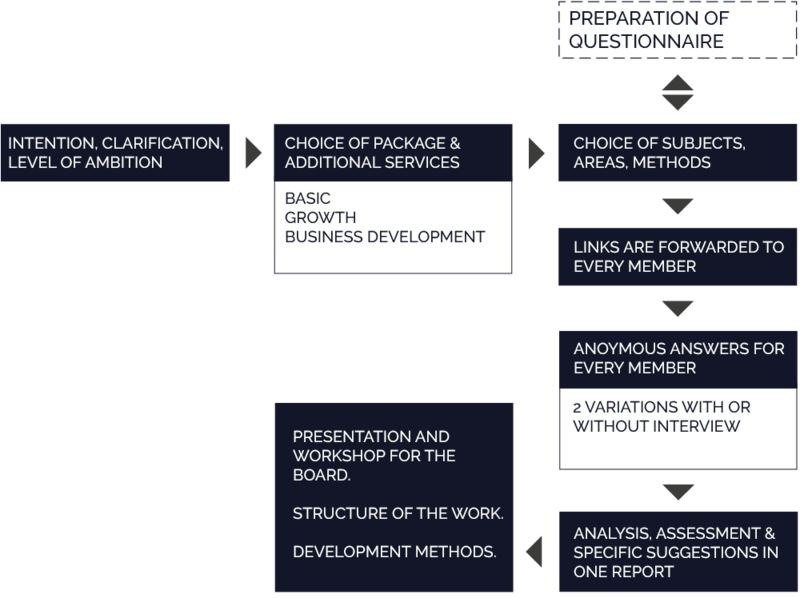 The board evaluation emphasizes the development perspectives for the boards work and concrete results, which results in a commercial improvement of the company. We will give you concrete suggestions of how to achieve a higher effectivity, based on the available resources in the board. 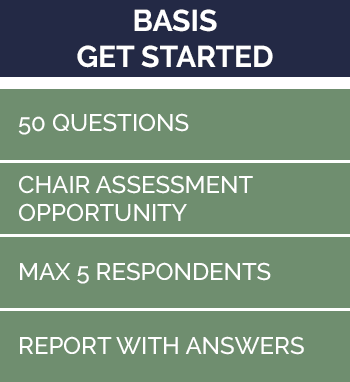 Due to an increased demand for getting evaluated boards and reviewed the results of their work, a lot of people are having trouble with making qualified questions and to ensure a valid process for the yearly board evaluation. This is a large task for the chairman, the management and the secretary. This is done to make sure that the ambitions, wishes and values are considered, in the evaluation of your specific board. We use 3 different packages, which we base our specific evaluation on. 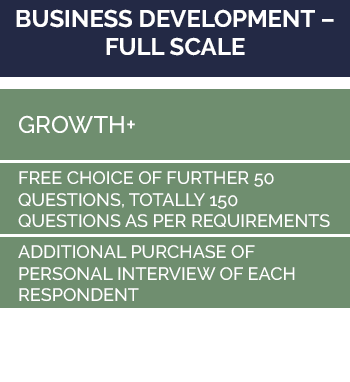 These packages can be bought as seen below, or with tailored additions such as presentations for the board, or a workshop follow up. A valid, external evaluation of the boards work foundation, methods and tasks. Overview of the development perspective for the board and its board members. Concrete evaluations of the individual and collective resources in the board. For us it is not enough to identify when a board can improve. We apply the results, to ensure it creates value for both the management and the board in an ongoing perspective. We work with board evaluations for both quoted, publicly owned, holding-, private and private equity fund owned companies. Everyone who wishes an easy and safe way of implementing evaluations on, which at the same time creates the foundation for development. Through close dialogue, we make sure that the results from the evaluation can be applied in your specific board. The process for BESTYRELSESVURDERING® can be seen below. WHO IS BESTYRELSESVURDERING® RELEVANT FOR? The banks sets higher demands! The international Capital Requirements Directive, which is to be implemented 01.01.18, deals with setting demands for better equity, better liquidity, and better continuous risk management. This results in banks having to monitor companies seeking capital infusion even closer. This creates a need for the banks to get knowledge about how the companies top management resources are looking, including both the management and the board. Because of this, the banks are seeking insight in the resources of the board, including the boards focus, tasks, targets and success criteria. This means that it is important for the companies to support and inform in the best way possible, since the banks risk management otherwise would provide a different result, which means a higher price for the desired financial infusion. If you work in a board who needs a financial infusion, a BESTYRELSESVURDERING® is particularly relevant for you. From an international standpoint, there is a great demand for transparency in the board work, which now includes Denmark as well. This applies no matter if you have an objective or subjective interest in the concerned company or organization. Because of this, the boards need to be able to document on which areas they create value and makes a business-oriented difference. The surrounding society wishes to know, whether the resources are used in the best way possible, and if it happens in a societally acceptable way. This means that the boards needs to be able to organize and show the documentation for the boards concrete results in an appropriate way, to make it applicable to the company’s most important stakeholders.